In the deceptively simple yet complex short film Cuts in Motion, filmmaker Brenda Contreras creatively tackles women’s self-image issues. A young woman swinging on a child’s swing set dangerously shaves her legs while marketing slogans of female empowerment through modern notions of beautification pass over her. The slogans alternate with comments of sheer condescension — boasting of their ability to manipulate human behavior — with sentences that put into practice what the others promise, compelling this particular woman to perform a dangerous act of self-mutilation. Most of the film is presented from a distance from the woman. However, periodically, Contreras flashes in garishly colored closeups of the woman’s legs that are covered in the nicks and cuts from the sharp razor she wields over them. 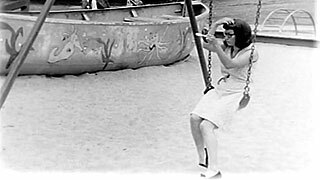 The swing set is an interesting location for the film. At once it makes the woman appear to be childlike and thus easily manipulated while at the same time it also conjures up the notion of a romantic location, as one might see a pretty girl being pushed by her male lover in a scene in a romantic Hollywood film. Of course in this case the lover is absent, someone who never comes despite the woman’s attempt to make herself “pretty” with her smooth — albeit nicked and cut — legs. Finally, the woman makes one last check of her appearance in her compact mirror before she strides off confidently into her life.